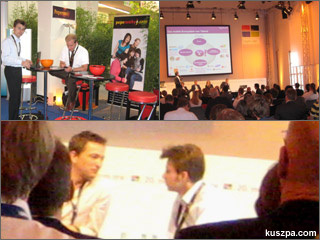 Our booth, yahoo lecture and me under discussion with myspace on a panel. Two days ago I was asked by Mark Wächter, if I can fill in for facebook on the Mobile Media Summit at MedienForum.NRW in cologne. They didn’t ask me first, but why not :o) So I had the great opportunity to join the panel ‘Mobile Social Web – Web 2.0 für die Hosentasche’ (English: Mobile Social Web – Web 2.0 for the trouser pocket) and to discuss the developments in mobile social networks with Sarik Weber (Vice President – Marketing, cellity AG), Olaf Kroll (Director Business Development Europe, Fox Interactive Media / MySpace.com), Mark Wächter (chairman of Fachgruppe Mobile of Bundesverbandes der Digitalen Wirtschaft e.V.) and Ossi Urchs (F.F.T. Medienagentur).